The 2018 Chevrolet Silverado 1500 LS is just the right amount of truck for any job or project. With great horsepower and a well-appointed interior, this truck can handle the tough jobs and look good doing it, keeping you from scratching your head over transportation needs. At Ressler Motors, our trained and friendly staff is eager to help you find your perfect match and keep it running like new for miles to come. Find your LS today at Ressler Motors. You’ll find everything you need and more in the 2018 Chevrolet Silverado 1500 LS. This truck features remote keyless entry, support for Android Auto and Apple CarPlay, and a rear-vision camera. You can stay connected to family and friends, trailer with ease, and have quick access to your vehicle when you need. Simple yet helpful is the name of the game for the LS. The engine makes all the difference in your truck, so pick what works for you in the LS. Choose from the 4.3L EcoTec3 V6 or bump up to the 5.3L EcoTec3 V8 for some extra power. Either way, you can hunt, fish, work, and play with ease and look good doing it in the LS. You’ve got the dependability, reliability, and capability of Chevy to work with you. The right color makes all the difference, from sleek black to look-at-me red. 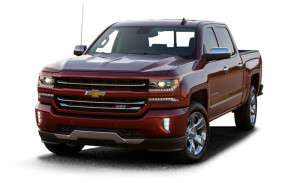 You get a great choice of colors for the 2018 Chevrolet Silverado 1500 LS, including Graphite Metallic and Red Hot. So take your pick and let your truck speak for itself.